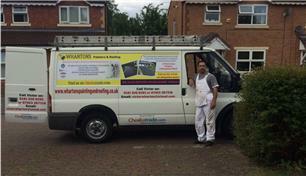 Whartons Painting and roofing is a family run Business with over 20 years’ experience and knowledge. We specialise in all types of interior and exterior painting and roofing repairs we believe in offering all our customers a professional and reliable service, reassuring that our purpose is doing the job right the first time. First for the quality of our work, total honesty and total reliability for you. Second, we use all top quality paints; Santex for masonry work, Dulux undercoat and primers for all your gloss work, Dulux trade for your top coat and gloss work. We also use Ronseal Wood stain and saddling wood stain. We also offer the full recolouring of your old discoloured roof tiles colour’s we apply charcoal. gray. brown. Or Terracotta. It’s a 2 coat-application that restores your discoloured roof to a new state. Have a look at some of the pictures and for a free quotation, please give us a call. Lymm, Northwich, Manchester, Glossop, Stalybridge, Lancaster, Morecambe, Knutsford, Wilmslowe Cheadle, Chester, Bolton, Macclesfield, Liverpool, Warrington, Cheshire.